I always look forward to the weekend, when I can spend long stretches of time with my quilting. Friday night, I got home from work to find that my new Lyle Lovett CD had arrived. I managed to wait until after dinner to hit "play" and sit down and put together one of my challenge blocks for the Modern Quilt Guild (the green one). 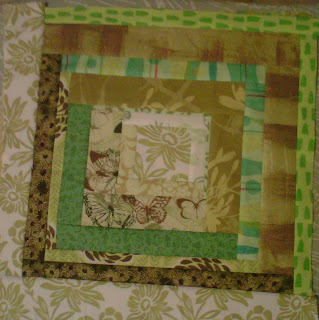 The assignment is to make a 12.5" wonky log cabin block in spring colors. My plan is to make one block each in pink, blue, yellow, and green, then cut them in quarters and make a block incorporating all four colors. It's my first attempt at a wonky log cabin and my first attempt as cutting up a block. I'm a little scared. If I mess it us, you can't "unpick" cutting up a block! 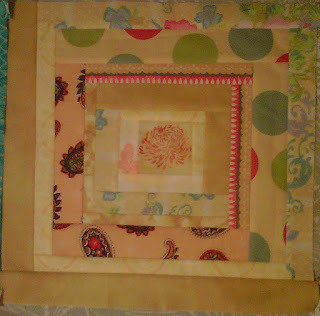 Here's the yellow block that I made last weekend. I also finished assembling the rows of the quilt-as-you-go Kaleidoscope Shadow quilt I'm making for my niece, so I had plenty of hand sewing on the sashing to keep me busy while watching TV on Saturday morning. Loved the CD and felt a sense of accomplishment on my quilting.